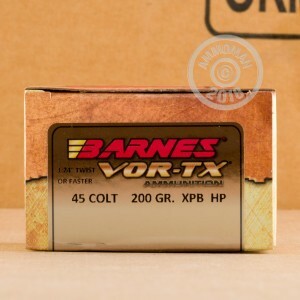 If you hunt with .45 Colt, you can't go wrong with Barnes VOR-TX bullets. These solid copper hollow points deliver superb penetration and expansion, making them a strong choice for bringing down predators and midsize game such as whitetail deer. 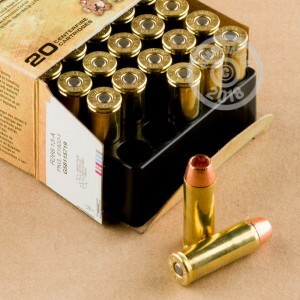 Each cartridge in this box of 20 fires a light 200 grain Barnes XPB ("no lead") projectile at a muzzle velocity of 1,025 feet per second. 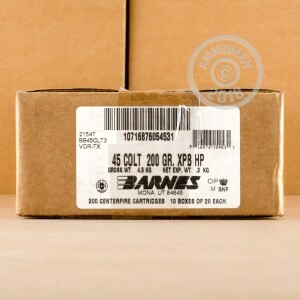 Barnes ammo is loaded Mona, Utah using non-corrosive Boxer primers and brass cases.